We’d love your help. 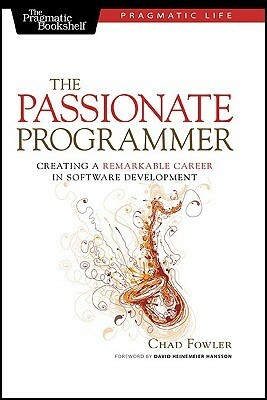 Let us know what’s wrong with this preview of The Passionate Programmer by Chad Fowler. Success in today's IT environment requires you to view your career as a business endeavor. In this book, you'll learn how to become an entrepreneur, driving your career in the direction of your choosing. You'll learn how to build your software development career step by step, following the same path that you would follow if you were building, marketing, and selling a produ Success in today's IT environment requires you to view your career as a business endeavor. In this book, you'll learn how to become an entrepreneur, driving your career in the direction of your choosing. You'll learn how to build your software development career step by step, following the same path that you would follow if you were building, marketing, and selling a product. After all, your skills themselves are a product. The choices you make about which technologies to focus on and which business domains to master have at least as much impact on your success as your technical knowledge itself--don't let those choices be accidental. We'll walk through all aspects of the decision-making process, so you can ensure that you're investing your time and energy in the right areas. You'll develop a structured plan for keeping your mind engaged and your skills fresh. You'll learn how to assess your skills in terms of where they fit on the value chain, driving you away from commodity skills and toward those that are in high demand. Through a mix of high-level, thought-provoking essays and tactical "Act on It" sections, you will come away with concrete plans you can put into action immediately. You'll also get a chance to read the perspectives of several highly successful members of our industry from a variety of career paths. As with any product or service, if nobody knows what you're selling, nobody will buy. We'll walk through the often-neglected world of marketing, and you'll create a plan to market yourself both inside your company and to the industry in general. To ask other readers questions about The Passionate Programmer, please sign up. This book is a great example of the state of most non-technical programming writing, in that it mostly exists to stroke the author's ego and give a pat on the head to his gen-x American colleagues. In its original form it was a list of tips aimed to help American programmers avoid having their jobs outsourced from under them, written as a series of short blog-style chapters that are not long enough to cover their topic, let alone dive deep enough to provide any insight. Everything the book looks a This book is a great example of the state of most non-technical programming writing, in that it mostly exists to stroke the author's ego and give a pat on the head to his gen-x American colleagues. Everything the book looks at is better discussed in other books, such as Being Geek: The Software Developer's Career Handbook which is a far better software career advice book, and The Pragmatic Programmer: From Journeyman to Master from the same publishers which has much more useful technical content. Just finished this on the plane. Am happy to write this review. This book falls broadly into two different but related categories - 1. How to be better at your job and 2. How to plan out a good career in the IT industry. I’ll focus on the first part first. This review is really for myself so I’m going to summarize my key takeaways and perhaps editorialize a bit (though the book has plenty of opinions itself). I found a pleasant cohesiveness between what the book recommends and the Amazon leadersh Just finished this on the plane. Am happy to write this review. This book falls broadly into two different but related categories - 1. How to be better at your job and 2. How to plan out a good career in the IT industry. I’ll focus on the first part first. This review is really for myself so I’m going to summarize my key takeaways and perhaps editorialize a bit (though the book has plenty of opinions itself). I found a pleasant cohesiveness between what the book recommends and the Amazon leadership principles. * Focus on being an asset to the business. A computer programmer doesn’t work in isolation. I am paid by a business that hired me to solve problems within a specific domain in order to positively influence the bottom line, and I’m trusted with the responsibility to thoroughly understand the trade offs and make the decisions that fit best within the business context. A software engineer is a problem solver first, and is not paid to be a technology zealot. * That said, be a technology zealot. Understand how technologies work from the bottom up so that you can thoroughly understand the solutions you recommend and implement. Learn different languages on the side and read up on the industry. Don’t become the carpenter with only one tool that he fits into use for every job. Go deep and go wide. * Don’t overpromise - learn to say no. Admit when you don’t know. In short, this will help you earn trust. * Own your mistakes. Don’t try to make mistakes, but don’t be so afraid to own them, and when you do make a mistake, own it and start working towards a solution right away. Fail fast and never try to prolong the time between bug discovery and action. * Learn to communicate well with people who don’t code. Assume that everyone your company hires is important to the business and when the need arises make a full effort to help them understand the problems you are working on and the solutions you are developing. Engineers are far from the only thing required for a successful team. * Related to the top point - learn the business. Have at least a rough understanding of where the money comes in from and how various teams contribute to business needs. This will help you make more enlightened first guesses, conversations, and final decisions when it comes to practical engineering decisions. * Don’t silo yourself or try to make yourself “irreplaceable” through similar means (writing code only you understand) - that is, anything that limits rather than promotes good communication. What you are actually doing is making yourself a liability to your company. Single points of failure are never good. * Budget your time. Personally, I’ve found the time-blocking mechanism described here and in Deep Work to be very helpful when I know what I need to get done. Set a hard start and finish to your day. Like that dragon thing in the fantastic beasts movie, your tasks will expand and contract (within reason) to the time that you budget for them. The 40-hour week is generally a good guide. Make your 8 hours of work focused and impactful. I used to be skeptical about this point, and certainly there are some weeks where this isn’t feasible, but more hours doesn’t always equate to more productivity. The Effective Engineer and Rest: Why We Get a more Work Done When We Work Less also effectively drive this point home. Guard against burnout. * Always try and know what you need to get done. A mediocre employee needs to be told what to do, whereas a good one takes initiative and figures out what to focus on. * No task is beneath you. Do a good job even with the mundane tasks. Be present in whatever you’re doing. * Learn to enjoy maintenance. Lower expectations actually provide a good opportunity to surprise and delight. * Learn a new language to learn to think differently. It’s fun too. * Hold yourself accountable. Every day, ask yourself if you’ve learned something new or become a better engineer than you were yesterday. In either case, ask yourself what about the day made it so. * Learn to predict industry trends. Keep up with the technology news. Don’t let yourself become a dinosaur. Read books, articles, and papers. Learn learn learn. * Contribute to open source projects (erm..may not be possible for employees of all tech companies). A good place to start is by improving test suite coverage in a lot of projects. * Try to get on teams where there are an abundance of better engineers to learn from. This will always be possible excepting a few of the truly great. Being surrounded by better players will make you better. Don’t look for situations where you will be the smartest person there. * Make the hang. Don’t be afraid to approach technology leaders and try to glean wisdom from them. Most people are happy to help. * Follow your curiosity. It may lead to unforeseen opportunities. Having written that out just now, I realize that this is probably a common fortune cookie message. Pros: it's good to see a book that encourages people to take a more disciplined look at their careers. The book covers many important ideas for being a successful programmer: work with people better than you; don't listen to your parents; be a generalist; find a mentor; learn how to fail; learn to say no; build your brand. Cons: the voice used in the book feels wrong--at times, it sounds like an infomercial or self help book. There are a number of weird programmer stereotypes and a strange focus Pros: it's good to see a book that encourages people to take a more disciplined look at their careers. The book covers many important ideas for being a successful programmer: work with people better than you; don't listen to your parents; be a generalist; find a mentor; learn how to fail; learn to say no; build your brand. Excelente livro para desenvolvedores de softwares (ou até mesmo outras profissões), com conselhos fundamentais para manter-se atualizado, motivado e, como diz o subtítulo, construir uma carreira memorável na área. "Too many of us seem to believe that specializing in something simply means not knowing about other things." "Muitos (desenvolvedores de software) parecem acreditar que especializar-se em algo significa, simplesmente, não saber sobre outras coisas"
Sobre Excelente livro para desenvolvedores de softwares (ou até mesmo outras profissões), com conselhos fundamentais para manter-se atualizado, motivado e, como diz o subtítulo, construir uma carreira memorável na área. "Be courageous enough to be honest." "Seja corajoso o suficiente para ser honesto." "The ability to write creates both a superficial perception of you and a real insight into how your mind works. If you can't organize your thoughts in your mother tongue so that others can clearly understand them, how can we expect that you can do it in a programming language?" "A capacidade de escrever cria, além de uma idéia superficial sobre você, uma visão interna de como sua mente funciona. Se você não consegue organizar seus pensamentos em sua língua nativa para que outros consigam entendê-lo, como esperar que você consiga fazê-lo através de uma linguagem de programação?" "The real meat of your career is not the promotions and salary advances. It's the time you spend working toward those advances. Or, more important, it's the time you spend working regardless of the advances." this looks to me like the point of view of someone that lost any passion for programming as an art/craft, to start seeing it from the typical egocentric manager point of view. I read the whole book simply to have a glimpse of what someone with this attitude really thinks. good technical managers should feel uncomfortable with the limited mindset that is promoted on the book. there are a few interesting and useful "blog posts" but several others could possibly be part of an anti-pattern book on " this looks to me like the point of view of someone that lost any passion for programming as an art/craft, to start seeing it from the typical egocentric manager point of view. I read the whole book simply to have a glimpse of what someone with this attitude really thinks. good technical managers should feel uncomfortable with the limited mindset that is promoted on the book. there are a few interesting and useful "blog posts" but several others could possibly be part of an anti-pattern book on "programming with passion". they seem to have been written with that "don't think too much, just write something already, so you can promote yourself and go to conferences"-mentality he advocates for your own career promotion. This was a great read. The author tries to explain what skills and habits a programmer has to develop in order to be successful. The chapters are short and every one of them ends with a tiny to do paragraph meant to help you develop a new skill or improve an old one. There are some analogies between the processes a programmer should follow and the ones a musician would. (The author himself being a saxophone player). Almost every chapter is well argumented. Several examples and analogies are presen This was a great read. The author tries to explain what skills and habits a programmer has to develop in order to be successful. I am glad that the recent ideas about a career as a programmer are written in one book. I get better insight than from reading bits in blogs and tweets. However the author is too personal, and he is writing too much about himself. So if you are not his friend or have similar experience for example your are not a jazz musician than it's boring and you skip half of the book. And it's short one. Be t I am glad that the recent ideas about a career as a programmer are written in one book. I get better insight than from reading bits in blogs and tweets. However the author is too personal, and he is writing too much about himself. So if you are not his friend or have similar experience for example your are not a jazz musician than it's boring and you skip half of the book. And it's short one. This is one book I wish I had at the beginning of my career. Or maybe I wish I could force any of my past non-tech managers or clients to read. It does a solid job of describing many of the realities of being a software craftsman. That said, I have to agree with a lot of the lukewarm reviews that there aren't really any earth-shattering revelations that will change the way you work if you're already established in this profession. Self analysis is always a good thing though, and this book dishes This is one book I wish I had at the beginning of my career. Or maybe I wish I could force any of my past non-tech managers or clients to read. It does a solid job of describing many of the realities of being a software craftsman. That said, I have to agree with a lot of the lukewarm reviews that there aren't really any earth-shattering revelations that will change the way you work if you're already established in this profession. Self analysis is always a good thing though, and this book dishes it out in healthy servings. There are also some decent stories and phrases that are worth remembering. The closing section is nicely written (if somewhat abrupt) and will make you feel good about being a programmer. The book does a fine job of tying together several areas of our profession, but for any particular subject hit there are probably a few books that would be more relevant than this one. All in all, it's a quick and worthwhile read. "I lost my job to India" did not sell well as he acknowledges in the introduction of this book, because that book was more of a rant than a solution. Everybody is aware of the problem i.e. losing jobs to outsourcing but he did not delve on the solution or how to save yourself from the cheaper onslaught! This book on the other hand teachers you how to rise above the crowd. How to differentiate yourself as a programmer worthy of hiring over a team overseas. This book deals with ECONOMICS of PROGRAMMING at a macro level and at a micro level. The book considers the programmer as a the product and teaches them how to build themselves as a super product and how to market that product. It is incredible, the programmer is the weapon! I was impressed with the author thoroughly, his concepts are out of the world. He talked about one concept at a time much like how they were discussed in the Pragmatic programmer. I have seen his ted talk where he talks about the Pragmatic programmer and how it inspired him to write this book. The Pragmatic programmer restricts itself strictly to the technical aspects of programming i.e. the pitfalls of programmers that cause huge disasters in execution of the project while completely ignoring the life of the programmer outside the terminal. This book out focusses on all the other aspects, like marketing your work, dealing with managers, prioritizing your work, planning your career, dealing with testing, maintenance vs new projects, timelines, dealing with clients, dealing with stakeholders, the importance of language, the importance of putting it in writing and the importance of showing your face among many others. I was particularly impressed with the concepts of programming by coincidence, which was also taught in the pragmatic programmer. The other concept which impressed me the most is the concept of Fail - Copy - Repeat Cycle, the number of times you repeat this cycle the better you become. He also tried to differentiate between a quick read of the code or scanning the code versus a complete typing of the code and he compared that with what Hunter S. Thompson did, by typing word to word the works of Hemmingway and Fitz Gerald! To differentiate between Active and Passive learning. Also that Gates finished his programs out of the trash cans in Harward. Copying builds muscle memory! The author also lived in Bangalore with his wife, thus adding more credibility to his account. His search for a better eco-system only showed him the similarity of eco-systems in various clones of the silicon valley. He also wondered if people have completely forgotten to develop client side software, and rightly points out that the barrier of entry for failure is quite higher, with a web based interface over a client side software. The effort is also greatly minimized for a web based interface. I had this book on my phone and read it in small chunks. It's written in a way that lets you easily dip in and out of it. It's an interesting read and gives you exercises to try at the end of each small vignette. I think that if you try them you will benefit greatly. I've been having a career for a long time and found it interesting that Chad validates a lot of things I have discovered empirically over the years, particularly about understanding why your employer employs you to have fun writing co I had this book on my phone and read it in small chunks. It's written in a way that lets you easily dip in and out of it. I've been having a career for a long time and found it interesting that Chad validates a lot of things I have discovered empirically over the years, particularly about understanding why your employer employs you to have fun writing code. I think the suggestion that you spend some time understanding how companies work, and how money is made is one that a lot of new graduates need to get on with. I thought some of his asides about the problems with the inability to say "no" when he was setting things up in India that can really trip you up were useful to know. Chad is himself really interesting, you can find an interview with him on the pragmatic programmers iTunes feed that was done just after the book was published that's well worth a listen. O livro define uma série de valores que um profissional deve adotar para conquistar uma carreira de destaque. O autor mostra como motivação, foco, dedicação, desejo de melhoria pessoal contínua, curiosidade, empreendedorismo são importantes na construção de uma carreira. Manter-se fora de sua zona de conforto é o mote. Nesse sentido, o livro é relevante não só para desenvolvedores de software, mas para qualquer profissional que deseje ter uma carreira memorável em sua área de atuação. Para seu públ O livro define uma série de valores que um profissional deve adotar para conquistar uma carreira de destaque. Para seu público alvo (especificamente, desenvolvedores de software), o livro traz um roteiro de ações que podem ser executadas para ajudar a refletir sobre aspectos pessoais e de nossa rotina de trabalho que criam obstáculos para a evolução da carreira. Com base nessas reflexões, é possível adotar medidas que levem às mudanças necessárias para manter-se relevante no mercado de trabalho. Let me start by saying I cringe whenever I hear people talk about what they're "passionate" about in a career sense. It's an over-used and hyperbolic adjective that's turned into yet another buzzword. If you're really "passionate" about customer service QA or something, perhaps you need to get out more. Life is short; save "passionate" for things that really deserve it. That said, this is a great "idea" book, in that it's a fast, easy read, and each short chapter gives you a topic to think about, Let me start by saying I cringe whenever I hear people talk about what they're "passionate" about in a career sense. It's an over-used and hyperbolic adjective that's turned into yet another buzzword. If you're really "passionate" about customer service QA or something, perhaps you need to get out more. Life is short; save "passionate" for things that really deserve it. That said, this is a great "idea" book, in that it's a fast, easy read, and each short chapter gives you a topic to think about, and see if it resonates with you. Some chapters you'll gloss over, others you might stop and think, "that's a good idea, I'll try that." Personal Review: I liked the book, but did not "really like it"
Originally this book was intended for US citizens to protect their jobs. "Your Job went to India" was its initial title. And as an Indian, I cannot accept the motivation for the author to write the book- to save Americans their jobs. Truth is- it is a level playing field, and there is no job security anymore. The author realised this, and hence changed the title. Its a good book- well written with action points to improve your programming Personal Review: I liked the book, but did not "really like it"
Its a good book- well written with action points to improve your programming career. Some good ideas and advices, but a little bit too much self help kool aid at times. This is a good companion to the Pragmatic Programmer (both belonging to "The Pragmatic Bookshelf"). I enjoyed the fact that author was/is a professional musician turned programmer because I can relate. It consists of small chapters all aimed to making your programming career remarkable. Some interesting ideas include thinking about your career like it is a business, be the worst among other programmers (like in music it will force to step up your game), teach what you know, contributing to an op This is a good companion to the Pragmatic Programmer (both belonging to "The Pragmatic Bookshelf"). I enjoyed the fact that author was/is a professional musician turned programmer because I can relate. It consists of small chapters all aimed to making your programming career remarkable. Some interesting ideas include thinking about your career like it is a business, be the worst among other programmers (like in music it will force to step up your game), teach what you know, contributing to an open source project, etc. etc. ... There are about 50 such chapters with practical advice and bullet points for specific actions to take. I've seen some of this advice before on blogs and in the "Pragmatic Programmer" but there is also a lot I didn't think of before. All in all it is a good read for those who feel their career is not at a level of awesomeness that it should be. Solid 360 degrees career advice for software developers, worthwhile read for everyone serious about his career in Software Technology. Like other books in the "Pragmatic Programmer" series most advice and stories told apply to work life or even life in general. The book makes clear that YOU are responsible for your happiness and career and contains some actionable "tasks" for you to do to start on a piece of advice given. I would have given 5 stars if the anecdotes would give a more coherent overa Solid 360 degrees career advice for software developers, worthwhile read for everyone serious about his career in Software Technology. I would have given 5 stars if the anecdotes would give a more coherent overall picture (they are well organized, just not perfectly well) and the tasks at the end of the chapters are more equally-sized and therefore actionable (some things suggested will take you several weeks to complete, you obviously won't do that during reading). * Задавались ли вы вопросами, что делать с полученными выше знаниями? * Как выстроить свой рабочий процесс, чтобы он приносил удовольствие? Книга рассказывает как раз о карьере программиста, точнее как она прошла у автора и какие выводы/советы он готов передать читателю. Я читал второе издание, которое помимо советов и историй с ним связанных, содержало в каждой главе раздел "Действуй", которая была своего рода tl;dr и побуждало тебя их (эти советы) применять. Very interesting read about working in the field and getting better at what you do. A great example from the book is that people don't know a particular technology yet 'because they didn't get an opportunity' to do that'. Isn't it your responsibility, not your managers? The book is full of plans and things that you can do yourself, and keeps responsibility on you. No more excuses, no more blaming others, you're not alone, you can do something about. On the down side is that there seems to be a somew Very interesting read about working in the field and getting better at what you do. On the down side is that there seems to be a somewhat strong focus on climbing the corporate ladder. Some of us don't plan to become managers, but want to be and stay passionate programmers. I really enjoyed every page of this book, if you want or you are passionate programmer/developer will find this book is very good and the best in this book that it is written as group of tips under chapters that group them by the area of improvement. This book will always be on my shelf so any time I want a tip in one or more of improvement area I will open in the read. Excelente livro, com dicas muito válidas para carreira. Oferece uma visão ampla de várias situações que podem ser aprimoradas profissionalmente. Estimulando a curiosidade, incentivando a buscar sempre o "novo". Don't waste your money on this book. All of the advice in this book is either obvious to someone who is truly interested in programming as a profession or else boils down to "don't be true to your personality, force yourself to be something you're not". I was not at all impressed. Good book about Software Development field and Includes tons of useful advices and tips on building a successful career. This book is more useful if you just started your career as you find a lot of tips are trivial if you are an experienced software engineer or manager. Though it is useful to go through this tips from time time even if you have lots of experience. Additionally, I find some tips like the ones about maintenance or contracting are tailored to author personal career choices and “so Good book about Software Development field and Includes tons of useful advices and tips on building a successful career. Additionally, I find some tips like the ones about maintenance or contracting are tailored to author personal career choices and “sold” as universal advice in the book. Software development is a vast field with lots of available choices to build successful career. I heard about this book when it was first published, in 2009. Fresh out of university, I was in the beginning of my career as a - very passionate, for the record - software developer. I remember reading The Pragmatic Programmer: From Journeyman to Master and a *lot* of other then-famous programming books, which were very useful then and are still worth reading now. Unfortunately, I don't think The Passionate Programmer aged as well. Overall, the writing feels too egocentric for my taste. One of t I heard about this book when it was first published, in 2009. Fresh out of university, I was in the beginning of my career as a - very passionate, for the record - software developer. I remember reading The Pragmatic Programmer: From Journeyman to Master and a *lot* of other then-famous programming books, which were very useful then and are still worth reading now. Unfortunately, I don't think The Passionate Programmer aged as well. When I was sitting down talking about my performance review (over the phone) with my beloved manager, I muted my phone when she said “presence.” I didn’t want the laugh to be audible. I wondered if she could hear the half-grimace and half-smile that I couldn’t wipe from my lips for the rest of our conversation. (...) Most of us who were willing to share our feelings disliked this manager. She did little to command respect, so it wasn’t much of a surprise. Nonprogrammers are, on the average, as intelligent as programmers. (That is to say that most of them aren’t very intelligent, but a few of them really are.) Chances are high that your customer is just as smart as you but just doesn’t happen to know how to program a computer. That’s OK. Yes. I can't imagine what kind of audience the author had in mind to write something that obvious, and even slightly insulting. The book also seems to promote an idea that I presently reject: that one must be an obsessed, exceptional, competitive professional to thrive in our industry, sometimes ignoring their own preferences and pursuing whatever is "the hottest tech" out there in order to stay relevant. Probably the advice that aged the most was the one about being present: the world is way more distributed today than it was ten years ago, so "set some time on your calendar to actually phone your coworkers and talk to them about trivial things" sounds just terrible.